Increasingly, studies are showing that hearing loss is not simply an inconvenient part of the aging process. Hearing loss can have serious effects on the aging brain health. As with many health issues, early intervention may be able to prevent damage as well as ease frustration. Hearing experts at Johns Hopkins University found in one study that hearing loss may come with some serious long-term consequences to healthy brain functioning. All study participants had normal brain function when the study began, according to senior study investigator Frank Lin, M.D., Ph.D., an assistant professor at the Johns Hopkins University School of Medicine. Over the six years that the study took place, the researchers found through generally accepted cognitive testing, that there was a decided decline in those who had hearing loss. “Possible explanations for the cognitive slide,” Lin said in an interview for Medical News Today, “include the ties between hearing loss and social isolation, with loneliness being well established in previous research as a risk factor for cognitive decline. Degraded hearing may also force the brain to devote too much of its energy to processing sound, and at the expense of energy spent on memory and thinking.” He adds there may also be some common, underlying damage that leads to both hearing and cognitive problems. A separate study at University of Colorado headed by Anu Sharma of the Department of Speech Language and Hearing Science, applied fundamental principles of neuroplasticity to examine the method the body uses to adapt to hearing loss. Neuroplasticity is the brain’s ability to forge new connections. According to Sharma, the hearing areas of the brain shrink in age-related hearing loss. "Centers of the brain that are typically used for higher-level decision-making are then activated in just hearing sounds...these compensatory changes increase the overall load on the brains of aging adults." Katherine Bouton is a former New York Times editor and author of “Shouting Won’t Help” as well as a new book called “Living Better with Hearing Loss.” Bouton has experienced progressive bilateral hearing loss since her thirties and has become the leading American advocate for people with this issue. We are limited in what we can do to protect ourselves from age related dementia. But staying healthy overall and reducing stress are considered valuable steps in at least staving off symptoms of Alzheimer's disease. Additionally, having your hearing checked regularly and obtaining a hearing aid if needed - and yes, wearing that hearing aid - may make a difference. 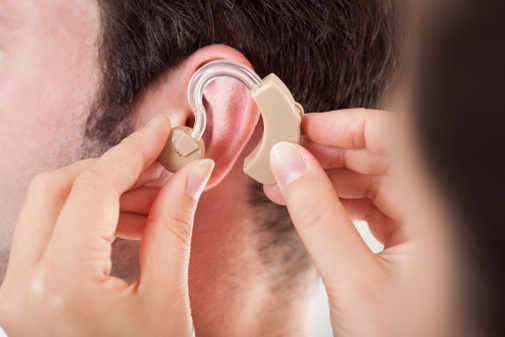 Wearing a hearing aid that is set to take care of your personal needs is bound to increase the quality of your life as soon as you become used to it. We may find, as researchers obtain more conclusive information, that this important step could protect your brain from significant decline as your age, as well. If you are a veteran, check with the Veteran's Administration to see if they can help you with the cost.